Problem : How do you make sure that the Library is visible to all the community members? Solution 1: Work with the SCA to develop, advertise and hold parent workshops on the Library and it’s resources. We do this once in September for the SCA and again in January. Solution 2: Find a former IB Film student to make a virtual tour video. 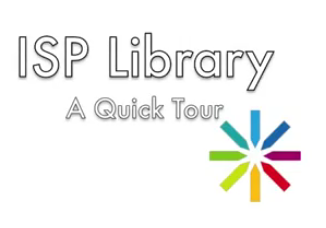 Anna Ramischwili-Schäfer, ISP Class of ’11, worked with the Library and Fine Arts staff to make this quick tour. She is now studying Media at the Faculty of Arts at the University of Brighton. The link for film is at : http://www.youtube.com/ISPrague#p/u/6/ghhYEqTDMec . Once posted on youtube, it’s marketed to the ISP Community through the ISP Library and IT Department facebook pages, through a parent contact emails, and through the SCA. Previous Previous post: How to stretch students’ minds. Next Next post: Google Workshop for Educators – WOW!! !